Both India and England now have equal chances of winning the second Test at Vizag after the fourth day ended with England needing 318 runs for a win with 8 wickets in hand. Earlier, India were restricted for a mere 204 runs in their second innings as they set the visitors a target of 405 runs. After starting the day at 98/3, Virat Kohli and Ajinkya Rahane started out carefully but Stuart Broad struck early for England by removing the later in the 4th over of day 4. Rahane seemed to have been in two minds when he tried to slowly steer Broad's leg cutter towards the third man region, but ended up giving an easy catch to Alastair Cook in the slips. Ravichandran Ashwin’s stay at the crease did not stay long as he edged another leg cutter from Broad for a catch to the keeper with the score reading 127/5. Virat Kohli tried to build a partnership with Ravindra Jadeja after Wriddhiman Saha's dismissal to Adil Rashid, but England made use of the rough patches formed on the pitch to get the Indian batsmen. Kohli was the next to depart on 81 when Ben Stokes pulled off a stunning catch in the slips to send back the Indian captain. Rashid then removed Jadeja and Umesh Yadav in quick succession as India looked set to be all-out well before 200. But some fine blows at the end from Jayant Yadav and Mohammad Shami took India to 204 and set England a target of 405 runs to chase. 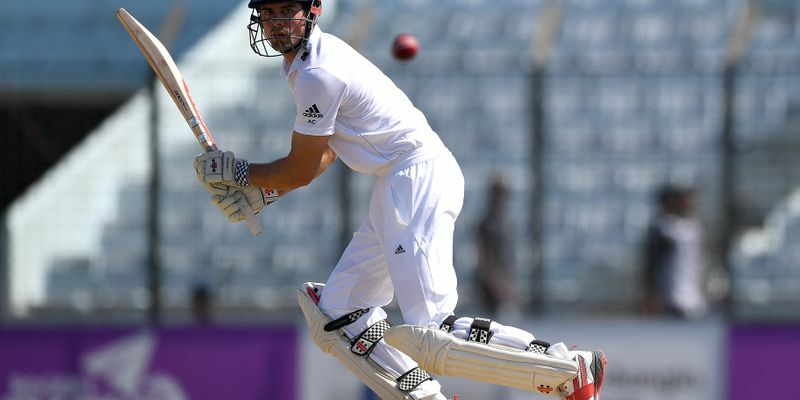 Chasing a huge target, England openers Haseeb Hameed and Alastair Cook were immensely patient in their approach. The left-right combination saw out an early dangerous spell from Mohammad Shami who was hitting the deck hard. Youngster Haseeb Hameed took multiple blows to his body during this venomous spell from the Indian speedster but remained focussed to play out the day. Though India received some half chances during this period, the Englishmen grinded it out to 40/0 by the end of the Tea break. Jadeja and Ashwin were able to get the right amount of spin but they were hardly able to trouble both the batsmen. There was some more drama left in the day after the Tea break as England were heading towards a solid opening stand. When the score was at 65/0, Ravindra Jadeja's delivery seemed to have hit Alastair Cook's pads first and was heading towards his leg stump but Kumar Dharmasena remained unmoved. India went for a review which showed that the delivery was marginally missing the leg stump deeming the batsman not out. To Virat Kohli's disbelief, India lost their second review in the next over when Ravichandran Ashwin was confident that he had trapped Cook lbw. But, finally, the off-spinner was successful when his delivery kept very low to hit Haseeb plumb in front of the wicket. When it looked like England would head into the final day with 9 wickets in hand, Ravindra Jadeja removed Alastair Cook with the final ball of the day by trapping him in front of the wicket. A crestfallen Cook, and the rest of the players, walked off the pitch with England needing another 318 runs with 8 wickets remaining. With Joe Root at the crease and the Indian spinners getting regular breakthroughs, the result of the game looks tantalizingly poised.